Imagine a forest garden, where the best of both farming and forestry combine to form an ecosystem that gives back to the land. Figs, pomegranates, pineapple guavas, mulberries, leafy greens, mushrooms and raspberry brambles grow and are harvested in harmony with shady canopies and a wide array of other edible plants, and the environment benefits from the forested landscape. What you may not imagine is that you can find this forest agriculture paradise in a quiet, suburban cul-de-sac in Bowie, Maryland. Just past the cheerful mailboxes and carefully trimmed lawns of its host neighborhood sits the forest garden, a ten-acre demonstration site founded in 2011 by Lincoln Smith through a grant from the District of Columbia Urban Forestry Administration and Metropolitan Washington Council of Governments. 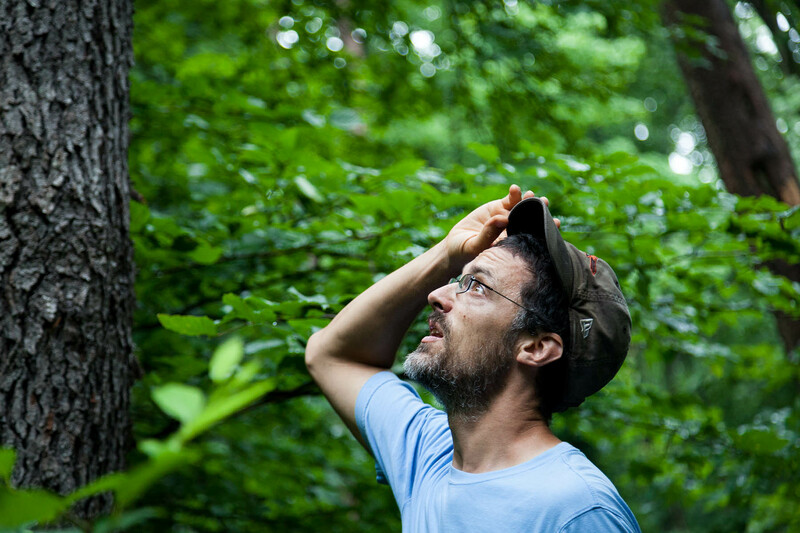 Smith designs forest gardens and teaches courses on production ecosystems through his organization, Forested, LLC. 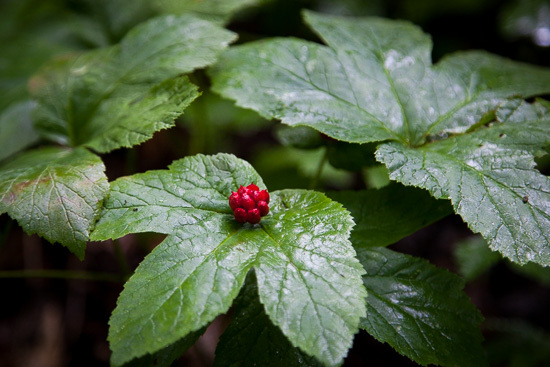 Goldenseal, a plant valued for its medicinal properties, grows in Smith’s forest farm. Stepping inside the rustic gate, you are greeted to an array of edible plants, both of the standard and unexpected variety. Oak trees make up a portion of the canopy, providing all of the traditional benefits of trees such as improving air quality, retaining water and providing shade, however they also supply a surprising staple: starch. In terms of production and space, acorns produce as much as or more food per acre than wheat. It is this kind of information that Smith hopes will get people thinking differently about food. Helping him to do that in a delicious way is Michael Costa, head chef for the Washington, D.C., restaurant Zaytinya. Food Forest Feasts are held twice a year at Forested and feature dishes created from the forest abundance. All over the forest garden, special emphasis is given to species that grow wild. A species of grapevine growing all over the garden is embraced as a food source and used by Chef Costa to create dolmas from the leaves. Fresh wine cap, shitake and oyster mushrooms feature in the meals. Spice bush is used to make a vinegar, sumac for a lemon spice. 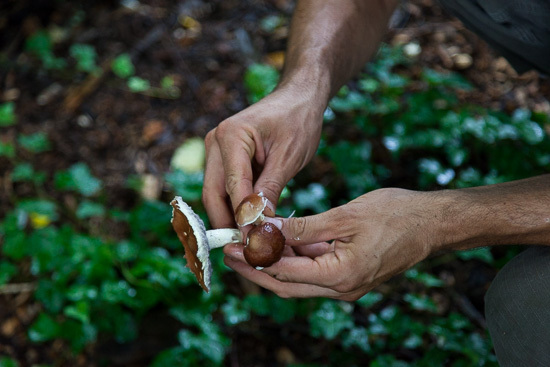 Smith picks Wine Cap mushrooms of several maturity stages growing in a mulched patch of ground inside the forest. Due to their quick growth rate, Smith tries to check on the wine caps, or Stropharia Rugosoannulata, twice a day during harvest season. Designed as a space for the community to be enriched, Forested’s forest garden is always open to the public. 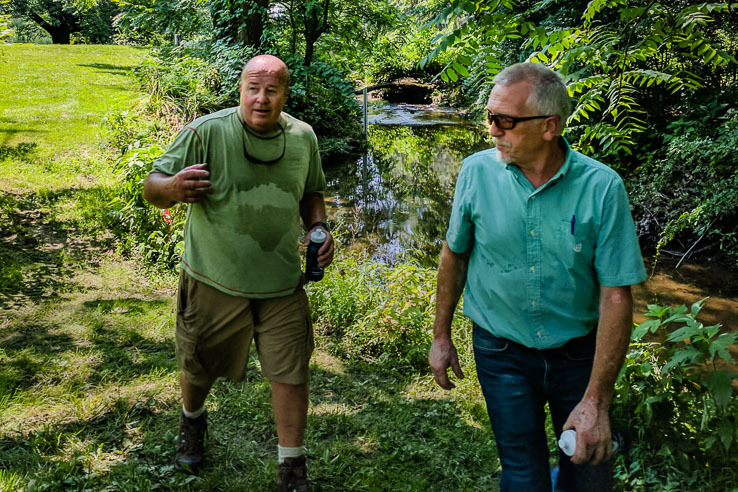 The land is owned by a local church, and the steps Smith had to take in order to rent it perfectly fit with his concept of urban forest agriculture. “I had to go to every home in the neighborhood,” he laughs, spreading his arms over the tops of kale and indicating the homes nearby. 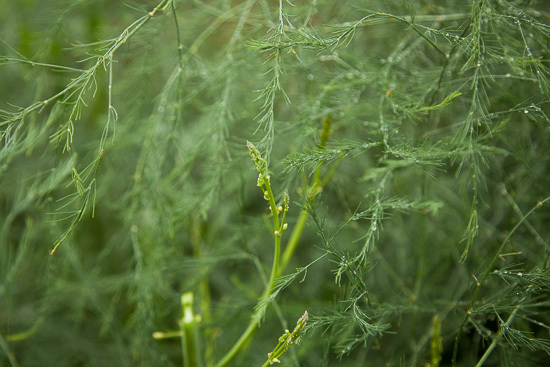 A close up of perennial asparagus as it grows in a sunny vegetable patch of the forest garden. The delicate, fern-like foliage grows throughout the summer before dying back to make way for fresh, harvestable asparagus shoots the following spring. If the forest garden is well-integrated with the human community, its relationship among the winged, crawling and rooted community is even more impressive. Take, for instance, the resident flock of ducks, whose grazing area rotates so they can forage throughout the garden. When harlequin bugs become a problem for the brassicas—crunchy vegetables like cabbages and radishes—the ducks are set loose to thin out the pests. Comfrey and dandelions are also a favorite snack of the ducks, who in turn spread nutrients as the comfrey and dandelions pass through their digestive systems. Thanks to the biodiversity encouraged by a healthy ecosystem, pests like the invasive Japanese beetle meet some formidable foes at Forested. Scolia dubia, a native and beautiful blue-winged wasp, preys on the beetle. And wheel bugs are given a free pass to feast on the mulberry crop, in exchange for providing a valuable service in actively liquefying Japanese beetles. There are complex interactions to an ecosystem, which when working in harmony produce a beautiful, living landscape. With the forest garden now in its sixth year, it is beginning to generate its own prizes outside, or ahead of, the man-made design. Jack-in-the-pulpit, sassafras and jewelweed now all grow unbidden. Will the herbalist begin creating jewelweed salves for bug bites and other irritations? Will they use that sassafras to create root beer? When the biosphere is diverse, it builds its own potential. 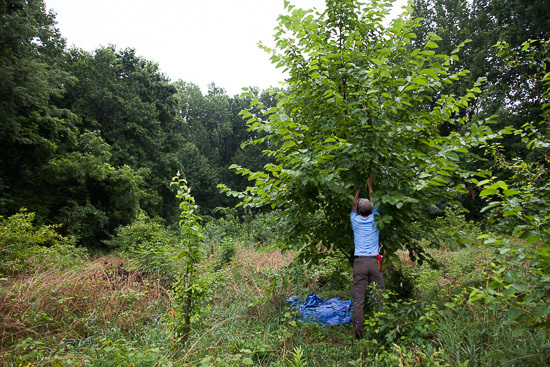 Smith tends a mulberry tree amidst his forest farm. 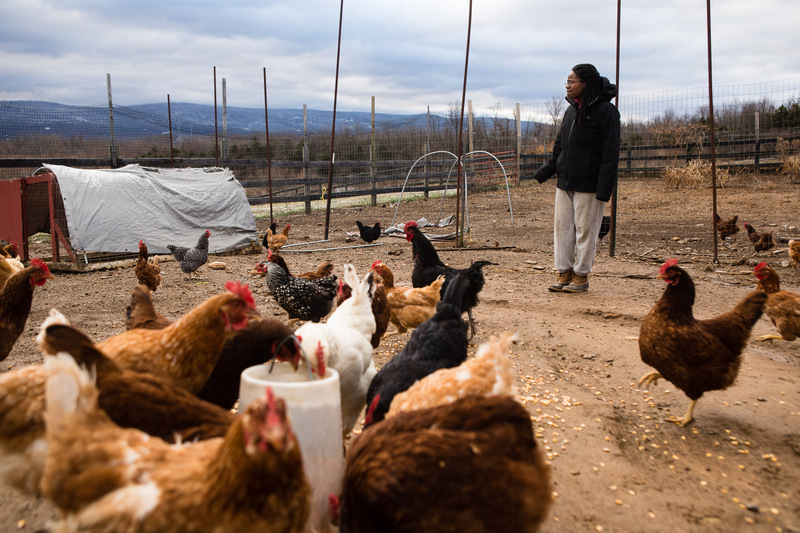 The farm is maintained by him as well as neighbors, other volunteers and members of the forest’s Community Supported Agriculture program, or CSA, whose customers receive produce from the farm. Food forests provide a wide variety of sustenance in a small space, and hit that double mark of community space and environmental improvement. 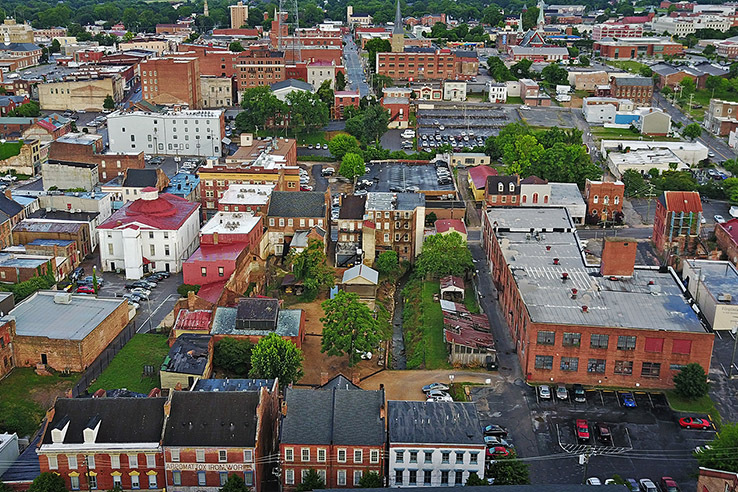 Forested recently worked on a project to design a new food forest for the city of Hyattsville in Prince George’s County, and discussion is underway for additional gardens. Given all the intertwined benefits, it is no surprise that many are excited to implement forest gardens into urban settings. About Caitlyn Johnstone - Caitlyn is the Outreach Coordinator at the Chesapeake Bay Program. She earned her Bachelor's in English and Behavioral Psychology at WVU Eberly Honors College, where she fed her interest in the relationship between human behavior and the natural world. Caitlyn continues that passion on her native Eastern Shore by seeking comprehensive strategies to human and environmental wellbeing. Love the idea of private forests available for plant harvesting but please remind/inform people that collecting plants from public lands is illegal. Remember removing plants from the woods will reduce a plant’s ability to reproduce and will adversely affect its long-term survival in that location.